Dubbo City Regional Airport (IATA: DBO, ICAO: YSDU) is a regional airport serving Dubbo, a city in the Australian state of New South Wales. 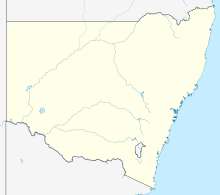 The airport is located 2 nautical miles (3.7 km; 2.3 mi) northwest of Dubbo and is operated by the Dubbo City Council. 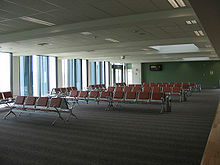 It is also known as Dubbo Airport or Dubbo City Airport. Airplanes began landing in Dubbo in the 1920s, though it wasn't until 1935 that land was purchased for an official airport. During World War II, the airport was reconstructed to be a military airport. The airport runway was redone by the Department of Civil Aviation in 1969, and a terminal was opened in 1970. The Dubbo City Council accepted ownership of the airport on 1 July 1970. The airport has been used for scheduled, charter, and freight services since then. The airport resides at an elevation of 935 ft (285 m) above sea level. It has two asphalt paved runways: 05/23 measuring 1,708 m × 45 m (5,604 ft × 148 ft) and 11/29 measuring 1,067 m × 18 m (3,501 ft × 59 ft). At Dubbo Airport there is a concern of animal and bird strikes. There has been an accident near the airport in July 2009 where a small aerobatic plane crash landed in a paddock near the airport. In April 2010, it was found that the PIN to access the secure areas of the airport such as the tarmac was taped to the gate above the keypad. This was deemed "not acceptable" by Federal Transport Minister Anthony Albanese. Despite this security breach, the airport managed to pass a security audit in 2009. In February 2013, Dubbo City Council (DCC) announced that it would screen all passengers and bags boarding Regional Express and QantasLink aircraft, after QantasLink announced it would introduce the Dash-8 Q400 to the route. DCC would also charge Regional Express (REX) more than A$300,000 per year for the screening, which REX sees as subsidising QantasLink, after DCC claimed to the Deputy Premier, Andrew Stoner, that it is required under the Air Transport Safety Regulations (ATSR) and that it is inflexible. REX hit back at the claims that screening was necessary, pointing out that Albury and Wagga Wagga Airports allow parallel departures under the ATSR and at Mildura, passengers are screened at no extra cost. REX lodged an official complaint against DCC with the Australian Competition and Consumer Commission over the screening charge. The Mayor of Dubbo, Mathew Dickerson, stated that the council wouldn't back down on the screenings and also stating that "I don't want to be the mayor when a Dubbo plane hits the Harbour Bridge because passengers were not screened". REX announced that would refuse to pay any security screening costs and is planning to re-deploy aircraft used on the Dubbo–Sydney route. On 14 March 2013, REX announced that it could cut the weekly services, in response to DCC decision to charge for screening, on the Dubbo–Sydney route from 82 to 73 flights from April 2013 and re-deploying its Dubbo–Sydney aircraft for the Wagga Wagga to Sydney route. 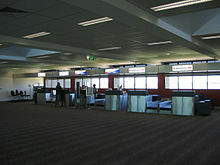 Dubbo Airport was ranked 36th in Australia for the number of revenue passengers served in financial year 2010-2011. ^ a b c "Airport Traffic Data 1985-86 to 2010-11". Bureau of Infrastructure, Transport and Regional Economics (BITRE). May 2012. Archived from the original on 24 March 2012. Retrieved 8 May 2012. Refers to "Regular Public Transport (RPT) operations only"
^ "Dubbo Airport (DBO / YSDU)". Aviation Safety Network. ^ "Flights from Dubbo to Brisbane and Melbourne announced". Retrieved 12 July 2018. ^ "FlyPelican launches Newcastle-Dubbo service". Australian Aviation. Retrieved 11 May 2016. ^ Alison Rehn and David Barrett (10 April 2010). "Dubbo airport PIN taped to security gate". The Daily Telegraph. ^ a b Clutterbuck, Angela (7 February 2013). "Rex angst over airport screenings". The Daily Liberal. Retrieved 14 March 2013. ^ "Calls to relax airport security". ABC News. Australian Broadcasting Corporation. 13 February 2013. Retrieved 14 March 2013. ^ a b "Dubbo City Council reportedly lied to NSW Deputy Premier" (PDF). 14 February 2013. Regional Express. Retrieved 14 March 2013. ^ Clutterbuck, Angela (7 February 2013). "It's 'fairly simple' to run parallel departure systems: Rex". The Daily Liberal. Retrieved 14 March 2013. ^ "REX complains to ACCC over Dubbo airport plan". ABC News. Australian Broadcasting Corporation. 25 February 2013. Retrieved 14 March 2013. ^ Saad, Abanob (20 February 2013). "Security stoush". The Daily Liberal. Retrieved 14 March 2013. ^ "REX Redeploys Dubbo Services" (PDF). Regional Express. 14 March 2013. Retrieved 14 March 2013. Wikimedia Commons has media related to Dubbo City Airport. This page was last edited on 26 March 2019, at 01:34 (UTC).